In This Issue: Tax bills’ rush to judgment | potential Medicare cuts | bundled payments’ demise | “essential health benefits” | HRRP concerns | long-term care patients’ rights | “no harm” deficiencies | primary care physicians’ primacy | CBT | robotics | Medicaid waivers | caregiving in the “sharing economy” | end-of-life high tech v. palliative care | and “skinny” health plans. conference committee agreement on tax legislation. We will send an update next week covering pertinent aspects of the merged bill. This week, the California Department of Finance issued a letter to the Members of the California Congressional Delegation on the impact of proposed federal tax plan on the state. While the details are specific to California, they are relevant to any state considering the impacts of this massive tax shift to favor upper income families and corporations over average working families. What is not mentioned in this letter are the immediate cuts to Medicare and other social safety net programs in the next budget needed by family caregivers and their relatives needing assistance. And if passed, the plans to go after more permanent cuts and restructuring of entitlement programs such as Social Security, Medicaid, and Medicare are scheduled for next year. German researchers have reported a successful outcome of a trial of telephone-based cognitive behavioral therapy (CBT) in ameliorating the stresses of family caregivers with dementia. Intervention group participants received 12, 50-minute sessions of individual cognitive behavioral therapy by trained psychotherapists within six months of the onset of caregiving. At the end of the intervention caregivers in the intervention group showed improvements with regard to their well-being, symptoms of depression, physical symptoms, and ability to cope with the burden of care and the care recipients’ challenging behavior. ﻿Harvard professor Dr. Muriel Gillick has authored a 326-page book entitled “Old and Sick in America: The Journey Through the Healthcare System.” Praising the book’s contents, Kaiser Health News’s Judith Graham sets the stage for Gillick’s analysis and recommendations. “Being old and sick in America frequently means a doctor won’t ask you about troublesome concerns you deal with day-to-day–difficulty walking, dizziness, a leaking bladder, sleep disturbances, memory lapses, and more. If you’re hospitalized, you have a good chance of being treated by a physician you never met and undergoing questionable tests and treatments that might end up compromising your health. It means that if you subsequently seek rehabilitation at a skilled nursing facility, you will encounter another medical team that doesn’t know you or understand your at-home circumstances.” Graham goes on to give Gillick an opportunity to outline her many recommendations via a transcribed interview. ﻿Uber, Lyft, and Airbnb’s dramatic impact on service delivery derives from what some are calling the new “sharing economy.” If it works so well for ridesharing and vacation rentals, why not home care employment, a prospect aired by Kathleen Webb, cofounder of a company providing payroll and tax services to families who employ household workers. “Much in the same way Airbnb acts as a vehicle to connect guests with hosts–who transfer payment securely through the Airbnb platform–families are using new platforms to find and pay their caregivers through a dedicated system.” Webb points to the creation of such companies as CareLinx and KindlyCare as examples of the emergence of a marketplace or registry that facilitates the private meeting, interviewing, and hiring of caregivers. “These sharing services not only provide secure means for delivering caregivers’ paychecks, they also support families in managing taxes appropriately, and fostering the employer to employee relationship in the home. What Kind of Care Do We Want at the End? Three bloggers—Terri L. Maxwell, Ian Duncan, and Matthew Harker— offer a much different vision in their post “Changing The Conversation: New Model of Home-Based Palliative Care for Patients with Serious Illnesses.” The writers highlight the services of Turn-Key Health, a national company that serves payers by providing specialized palliative care to patients who are struggling with advanced illness and living at home. “Through its palliative illness management program, Turn-Key contracts with local hospice and palliative care organizations that have dedicated teams of nurses and clinical social workers. Turn-Key then deploys these clinical teams to patients’ homes. Turn-key also provides the clinical teams with training, oversight, and support, and makes available to them health assessment tools to guide and document all home and telephonic visits. A one-year program at Mount Carmel Hospice and Palliative Care tested and validated the approach for seniors, demonstrating that community-based palliative care teams equipped with the right tools and training can improve care quality and address burdens associated with advanced illness. Last week, Executive Director Kathleen Kelly was in Washington, DC, for meetings with the Eldercare Workforce Alliance, a group of 31 national organizations (including Family Caregiver Alliance/National Center on Caregiving) addressing the workforce crisis in caring for an aging America. This week, Director of Operations and Planning Leah Eskenazi attended AARP’s Family Caregiving 2018: An Executive Summit. Panel discussions began with Senators Susan Collins (R-ME) and Tammy Baldwin (D-WI) on Family Caregiving in Congress addressing policies that work for family caregivers, including the RAISE Family Caregivers Act. For those on Twitter, visit the hashtag #futureofcaregiving for a run down of the summit. It’s simply part of being human. It’s what we do. 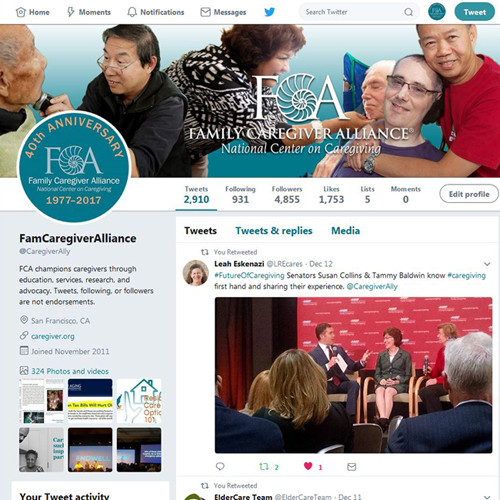 With your support, Family Caregiver Alliance/National Center on Caregiving will continue to provide services to family and friend caregivers AND work to advance policies and programs in every state. 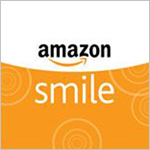 Join the Conversation ( twitter.com/CaregiverAlly )! Contributing to Caregiving Policy Digest are Alan K. Kaplan, attorney and health policy consultant, Kathleen Kelly, and Francesca Pera (editing and layout). 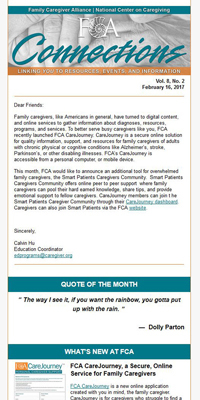 FCA's Connections e-newsletter focuses on issues and information important to family caregivers. The newsletter regularly covers tips, articles, and helpful advice that can assist families with the numerous daily care tasks that caregiving for loved ones presents — including the often overlooked “caring for yourself.” While much of the content can prove helpful to caregivers nationwide, the events included are local to the six-county region of FCA’s Bay Area Caregiver Resource Center. Archive of past issues here.